When young designers imagine the MagLab’s public areas, the unique collaboration creates more than just ideas. MagLab Director Greg Boebinger gives interior design students a primer about the lab. Students work in groups on their projects. 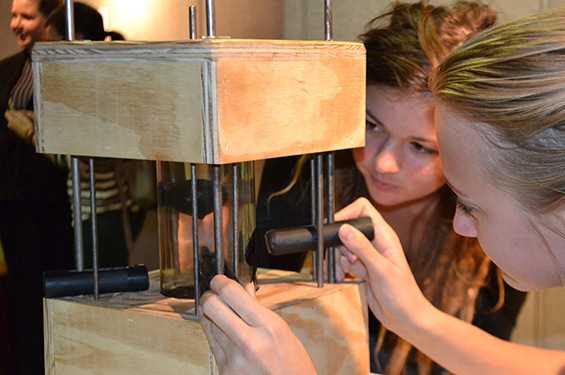 Students install an interactive exhibit on ferrofluids designed for the lobby. 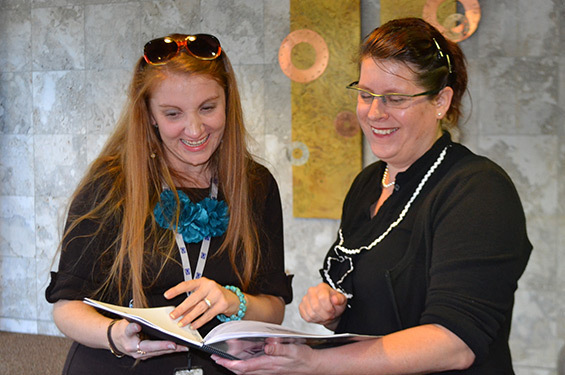 MagLab Public Affairs Director Kristin Roberts (left) with Mk Haley, who supervised students for the project. MagLab staff, users and visitors vote on the designs. Florida State University (FSU) students collaborated with MagLab staff this fall and winter to reimagine the 20-yearold lab's public spaces. The interior design students' biggest challenge: Redo the lab's lobby, reception area and café — a 5,600-square-foot space where visitors gather for tours and researchers collaborate over coffee. For years, the lobby walls featured a dated timeline and a photo of the brilliant, quirky inventor Nikola Tesla. The lab wanted something more interactive and fun, but something that still maintained the gravitas befitting a renowned national lab. With the most admired interior design program in the country at FSU, why look anywhere else for a design project? This story appeared in Vol. 22, No. 1 of MagLab Reports. Read more stories from the lab's triannual magazine. What happened next is a story peppered with intriguing people, events and things, including: a Disney design expert; a massive design workshop; a powerful Tesla machine; jars of goopy ferrofluid; an interactive guitar exhibit; and more than 100 FSU students exercising their best sky's-the-limit thinking. For two decades, Mk Haley has created top-of-the-line, museum-quality exhibits as an "Imagineer" at Disney. For this first-ever MagLab/design school collaboration, she joined the FSU faculty as an entrepreneur in residence and taught "Interaction and Advocacy for the National High Magnetic Field Laboratory" — better known as "the MagLab class" — to the 13 advanced art and design students enrolled in it. She began by opening her young designers' minds to a new world of possibilities. She took them to her home turf where some of the best interactive exhibits are produced: Walt Disney World in Orlando. "We got some amazing behind-the-scenes advice on how to make high-impact, hands-on educational exhibits," said FSU doctoral art-education student Samuel Rosenstein, who helped create one of the prototype exhibits. "This has been the most incredible experience I've ever had." The first stage of Project MagLab was a large-scale design charrette: a design workshop that engaged students from the entire interior design department to create a reimagined look for the MagLab's atrium lobby/reception/cafe space and main tour stops. Their designs had to serve sometimes competing goals of encouraging scientific collaboration, while also providing an engaging and interactive public experience. Working in teams of four or five the 114 students had less than a week to create their design and post it in the same area of the lobby where the timeline had hung. Some featured miniature three-dimensional models. All incorporated the MagLab's new logo — an "M" with a vector above it — and many featured the MagLab's main logo color, purple. 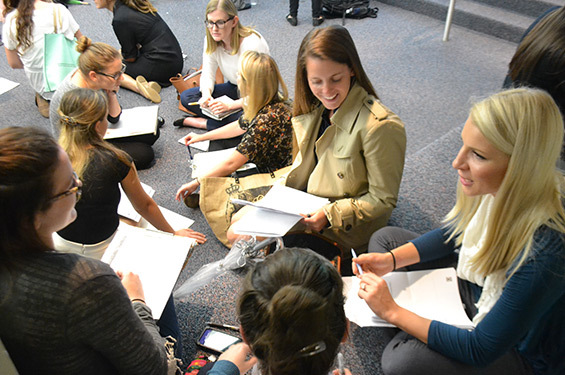 "One of the hardest things for these students was the teamwork," said Steven Webber, an interior design assistant professor. "But they loved having the MagLab as their client." 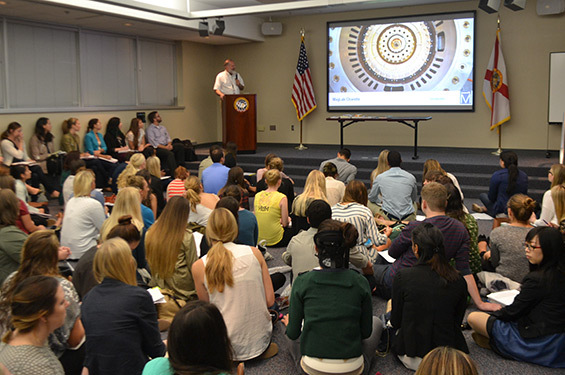 Tony Purvis, a visiting FSU assistant professor in the Department of Interior Design, agreed. "I don't think a single student who worked on this project really had any kind of hard science background," he said, "but they really enjoyed the science aspect of it." For many of the young designers, Project MagLab was a mind expanding experience. "I never thought that there were magnets like this, on this kind of big scale," 20-year-old Madison Campbell said. "It was very overwhelming to just walk though here," 19-year-old Maddie Hogue agreed. "Just the sheer scale of the building and how it's separated into these different sections, that was hard to comprehend at first," said Gabriel L'Heureux. "We've never done anything on this kind of scale before," said Sasha Pusey. But after the students toured the lab several times and spoke with staff and scientists, they grew more accustomed to the space. They held brainstorming sessions on how to best communicate the lab’s mission and the science behind the experiments. "We tried very hard to engage visitors and expose them to the scope of the work that's being done here," senior Jeremy Sackler said of his team's redesign, Due North. "The hardest part was sorting through all the ideas we had, and figuring out which would be the most successful." The students' designs added creative features to the lab including pop-out meeting tables along the lobby's main staircase, futuristic furniture, individual and group meeting areas, decorative geometric designs and vectors, beautiful wood paneling and outdoor seating. After the charrette was over, MagLab staff, users and visitors voted on the designs. Awards were presented and most of the students moved on to other projects, but about 20 students continued with Project MagLab. Seven design graduate students culled the charrette redesigns to finalize three formal design proposals. 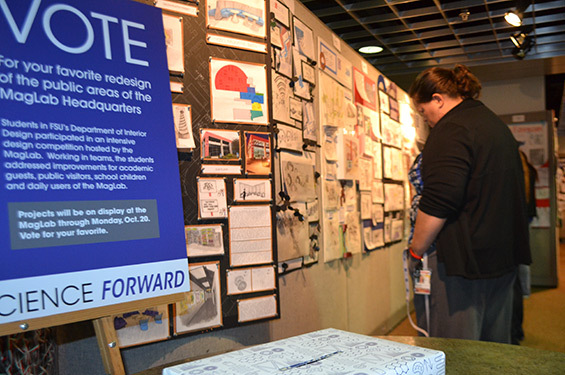 Haley's 13 advanced students worked to create six dynamic exhibits, drawing on some of the best ideas generated during the charrette. The group working on building the prototypes started with 28 original ideas, instructor Haley said, and whittled them down to a top 10. Then the students focused on what was most feasible given their time frame and budget. Finally, they settled on six ideas. An electric guitar that a visitor can play, with sound-activated lights that explain aspects of electric currents and magnetic fields. The guitar display was inspired by an animation on the MagLab's website. A tesla coil hooked up to a keyboard; the coil creates music through heat and pressure. During its demonstration, sounds boomed from the lab's lobby, luring curious staff from their labs and offices. Jars of black, goo-like ferrofluid (liquids that become magnetized in the presence of a magnetic field) demonstrate a magnet’s effect on materials. Visitors use magnets of varying strength to create temporary sculptures. A wind tunnel that uses air as a metaphor to demonstrate magnetic field strength. Compasses for a magnetic scavenger hunt around the lab. Window clings to help explain magnetic resonance machines. "These students worked incredibly hard," said Haley. "I'm very impressed with them and what they've done. They've created the kind of exhibits that guests at the lab will want to interact with and entice them to learn more about what you can do with big, powerful magnets. And that was our design goal: We wanted visitors to the MagLab to leave with a sense of wonder and a greater interest in science." "I was impressed with the students' enthusiasm and excitement at the outset," said MagLab Director Greg Boebinger, "as well as the ideas and the exhibits they produced." For the next few months, he added, the lab will continue to evaluate where to go next with the prototype exhibits and the three major lobby redesigns. "At this point, an architect has begun to help us determine what might be possible and what might be affordable," Boebinger said. "All in all, this is a very exciting component of the MagLab's 20th anniversary celebration."